Has your grass got you down? Living in the Denver area it is quite easy to see why. Many grasses are quite difficult to grow and with water conservation efforts in place, it makes it all the more difficult. Two of the easier grasses to grow in Denver are Buffalograss and Blue Grama. Both are very easy to maintain and they take very little water. However, these two grasses have a very short growing season and you will be left with a brown yard from late September or Early October into mid to late May. Most homeowners would love to have a perfectly manicured lawn, but this can be time consuming to maintain, especially in drier areas. Many Colorado residents still dream of having a a yard with lush, green grass. Don’t you? There is an easier way of getting the yard you have always dreamed of in Denver. Through the use of artificial turf, more families are getting the chance to enjoy a green yard without all the watering and maintenance. One of the main benefits of having artificial turf is it means you can finally put the lawnmower, hose, and weed-whacker up for sale on Craiglist. Having artificial turf means not having to ever spend another weekend mowing, fertilizing, or aerating the lawn ever again. Once September hits in the Denver area all that is left is a sea of tan lawns. Your would be the exception to that rule if you had artificial turf installed. Synthetic lawns have the ability to stay green year round and considering they offer UV protection, they will not fade or lose their lush color over the years. One other benefit to consider with artificial turf is that there is never a need to use any harmful chemicals or pesticides on your lawn. This makes your lawn one of the safest spots on a warm summer day for your pets and children to lay and play. Artificial turf first became widely known in the 1960s when it was used in the Astrodome, a popular sports stadium in Texas. In fact during that period, many people called any similar product Astro Turf. Since then it has become more and more popular in residential applications since it is so easy to maintain. Between pet areas, watering restrictions and an ever changing climate, it’s not always easy to keep your backyard lush and green. And with the growing popularity and acceptance of artificial turf in our neighborhoods, new types of artificial turf have been designed specifically with the needs of the homeowner in mind. In a perfect world, it would seem that your dog and grass could coexist peacefully. However, having a dog typically means having brown spots on the lawn, up turned plants and bare spots where nothing ever seems to grow except the mud puddles. 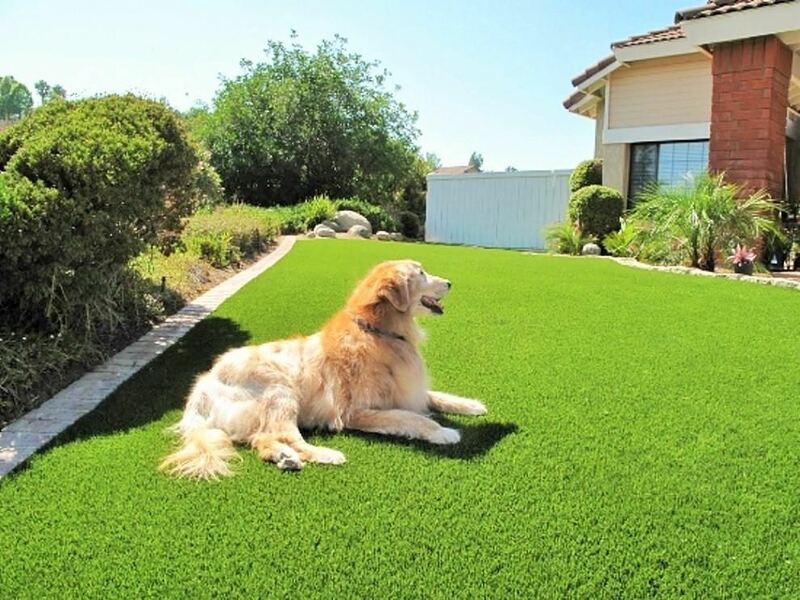 With dog-friendly artificial turf, your four-legged friend will be as happy as a clam as will you. When the dog urinates on the lawn, it simply drains through which means there will never be any brown spots on the lawn. 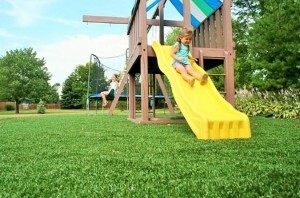 Synthetic grass is becoming a popular choice for many children’s play areas. Having a safe spot for your children to play is very important for all parents. Many have resorted to creating beautiful playgrounds in the backyard. However, little feet tend to damage grass and toss mulch all over the yard. That is why you may be interested in playground synthetic grass. Not only is this artificial turf more durable than typical synthetics it is also 20% cooler. Meaning even on the hottest days, your little ones will not burn their fingers and toes while playing outside. For years, you have dreamed of having a lawn that could be featured on a home and garden magazine. However, like so many others you simply may not have the time or money to manicure a lawn to perfection. In that case, there is artificial turf designed just for landscaping. This synthetic grass is absolutely stunning and is designed to make people stop and look at your lawn. It typically has a lower shine and a deeper green. It is available in the Denver area in a variety of blends and textures. There are several dealers located in the Denver area that specialize in artificial turf. One of the easiest ways in finding a dealer is simply talking to your friends and get a recommendation. However, there are a couple of things you will want to keep in mind when looking for an artificial turf installation company. It is always wise to see the work of any improvement company before choosing to do business with them. Talk to the professional and see if they have any before and after pictures available. Usually, these can be found on their website as well. The company you choose should offer a wide selection of products. Not only will you find various varieties of grass, but types for any need. As we have discussed there are turfs built for pets, children, landscaping, and other needs. Be sure to discuss your family’s lifestyle and intended use for the grass in detail with your installer so they can help you choose the right product. The artificial turf should have some form of a guarantee. This is typically between 8-10 years depending the installer and company. Also, the dealer should be licensed to do the work on your property. For some artificial turf dealers, all of their installers have to be licensed by the dealer to preserve the standards and integrity of the product. 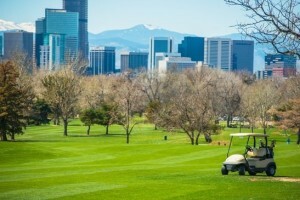 You don’t need to live on a golf-course to have a green lawn year round in Colorado! 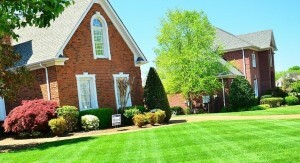 Many people would consider it a dream to have a lush front yard and never have to worry about maintaining it. For many the only way to do that is by having a professional gardener. However, you can have that lawn you always dreamed of having with the help of artificial turf. Call a local dealer today and see how artificial turf can change your life for the better.